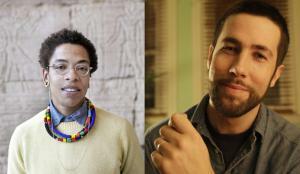 BORDC/DDF is pleased to present Lyric Cabral and David Felix Sutcliffe the September 2015 Patriot Award. Lyric and David’s first film, (T)ERROR, premiered at the 2015 Sundance Film Festival where it received the Special Jury Award for Best First Feature. The critically acclaimed documentary not only explores a controversial FBI sting-operation, but may be the first documentary to ever do so in real time. After Lyric’s neighbor of several years, Saeed Torres, disappeared she later discovered that the former black revolutionary was leading a double life as an FBI informant. Lyric told Democracy Now! “the apartment in which we had been conversing was, in essence, an FBI safe house. The rent was being paid by the FBI. It was wired with audio and video surveillance.” With a “weird mix of intrigue and repulsion,” Lyric remained in touch with Saeed after he revealed his double life to her, speaking on the phone with him about once a month for a decade. With his interest in FBI sting operations piqued, David expressed his interest in making a film about FBI informants. Shortly after this Saeed revealed to Lyric that he was conducting another sting operation for the FBI. David and Lyric were able to get him to agree to speak on camera without his superiors’ knowledge about what he was doing. In addition to talking to the Saeed in real time during the sting operation, David and Lyric also spoke to in real time and on film the man he was targeting, Kharlifah al-Akili. Neither man was aware that the filmmakers were speaking to the other. During this time Kharlifah began to suspect he was being set up by the FBI and contacted the National Coalition to Protect Civil Freedoms (NCPCF), of which both the Bill of Rights Defense Committee and Defending Dissent Foundation are member organizations. NCPCF advised Kharlifah to hold a press conference denouncing the FBI’s plot against him, but just days before the scheduled press conference Kharlifah was arrested. While he was never charged with anything terrorism related, he was convicted of possessing a firearm while having a prior drug felony arrest. For renting a gun during an outing to a shooting range with friends Kharlifah was sentenced to eight years in prison. The NCPCF believed the FBI was reading their emails about the press conference. The press conference went on, without Kharlifah, and is featured in the film (with a cameo appearance by BORDC’ Shahid Buttar). Kharlifah’s story is far from unique, since September 11 well over 100 people have been prosecuted as the result of dubious FBI sting operations—operations that civil liberties advocates consider to be entrapment. What is unique is that two courageous journalist were able to document the operation, both from the perspective of the informant and the target, in real time. As a result, Lyric and David have created a film that raises powerful question about the impact of the FBI’s so-called counter terrorism investigations on our Bill of Rights.